Background and purpose: Overfeeding increases adipose tissue mass and leptin production and up?regulates the renin?angiotensin system in adipose tissue in rodents. Here, we determined the effect of chronic treatment with the renin inhibitor, aliskiren, in a model of diet?induced obesity in mice, on: (i) body weight, adipose tissue weight and plasma leptin; (ii) food intake and caloric efficiency; and (iii) angiotensin II (Ang II) in adipose tissue. Experimental approach: Four?week?old C57BL/6J mice (n= 40) received aliskiren (50 mg·kg−1·day−1; 6 weeks) by means of a subcutaneous osmotic Alzet minipump. Animals were given either a low?fat (10% kcal from fat) or a high?fat diet (45% kcal from fat) during this period. Food?intake and body?weight variation were monitored during treatment. Key results: In addition to a decrease of plasma renin activity, aliskiren reduced body?weight gain, adipose pads and plasma leptin concentration, independent of the diet. In adipose tissue, local concentrations of Ang II were also reduced by aliskiren. Conclusions and implications: Aliskiren limited the gain of adiposity in young mice. This effect was not due to changes in food intake or caloric efficiency and might be related to a down?regulation of the local renin?angiotensin system in adipose tissue. These effects were accompanied by reduced plasma leptin levels. As Ang II favours differentiation of adipocytes, it is possible that the decreased adipose tissue was linked to changes in adipocyte size and number. Stucchi P, Cano V, Ruiz-gayo M, Fernández-alfonso MS. Br J Pharmacol. 2009;158(3):771-8. Protection Against beta-Amyloid Neurotoxicity by a Non-Toxic Endogenous N-terminal beta-Amyloid Fragment and its Active Hexapeptide Core Sequence. High levels (μM) of beta amyloid (Aβ) oligomers are known to trigger neurotoxic effects, leading to synaptic impairment, behavioral deficits and apoptotic cell death. The hydrophobic C-terminal domain of Aβ, together with sequences critical for oligomer formation, is essential for this neurotoxicity. However, Aβ at low levels (pM-nM) has been shown to function as a positive neuromodulator and this activity resides in the hydrophilic N-terminal domain of Aβ. An N-terminal Aβ fragment (1-15/16), found in cerebrospinal fluid, was also shown to be a highly active neuromodulator and to reverse Aβ-induced impairments of long-term potentiation. Here, we show the impact of this N-terminal Aβ fragment and a shorter hexapeptide core sequence in the Aβ fragment (Aβcore: 10-15) to protect or reverse Aβ-induced neuronal toxicity, fear memory deficits and apoptotic death. The neuroprotective effects of the N-terminal Aβ fragment and Aβcore on Aβ-induced changes in mitochondrial function, oxidative stress and apoptotic neuronal death were demonstrated via mitochondrial membrane potential, live reactive oxygen species, DNA fragmentation and cell survival assays using a model neuroblastoma cell line (differentiated NG108-15) and mouse hippocampal neuron cultures. The protective action of the N-terminal Aβ fragment and Aβcore against spatial memory processing deficits in APP/PSEN1 (5XFAD) mice was demonstrated in contextual fear conditioning. Stabilized derivatives of the N-terminal Aβcore were also shown to be fully protective against Aβ-triggered oxidative stress. Together, these findings indicate an endogenous neuroprotective role for the N-terminal Aβ fragment, while active stabilized N-terminal Aβcore derivatives offer the potential for therapeutic application. Cardiovascular effects of small peptides of the renin angiotensin system. The renin-angiotensin system (RAS) is a unique hormonal cascade which is composed by multiple enzymes and effector peptides. Recently, new peptides presenting biological activity have been discovered, increasing the complexity of the RAS Here, we evaluated the effects of small peptides of the RAS in coronary bed of rats. Firstly, we examined the direct effect of small angiotensinergic peptides Angiotensin Ang) -(1-5), Ang-(1-4) Ang-(1-3), and Ang-(1-2)] in coronary vessels. Noteworthy, it was observed that Ang-(1-4), Ang-(1-3), and Ang-(1-2) caused a significant reduction in pressure perfusion. Because Ang-(1-2) was the smallest peptide tested and presented the major effect, we decided to investigate its mechanisms of action. The effect of Ang-(1-2) was partially dependent on the Mas receptor, nitric oxide release and angiotensin-converting enzyme. Importantly, Ang-(1-2) reduced the blood pressure of Wistar rats and SHR Interestingly, SHR presented a more pronounced decrease in blood pressure levels than Wistar rats. 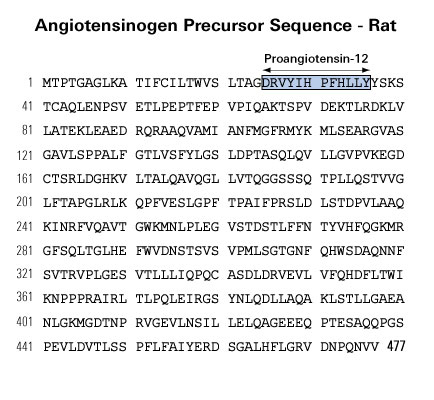 Altogether, these data showed that angiotensinergic small peptides hold biological activities in coronary bed of rats. Moraes PL, Kangussu LM, da Silva LG, et al., JrPhysiol Rep. 2017 Nov;5(22). pii: e13505. doi: 10.14814/phy2.13505. Angiotensin II-derived constrained peptides with antiplasmodial activity and suppressed vasoconstriction. Angiotensin II (Ang II) is a natural mammalian hormone that has been described to exhibit antiplasmodial activity therefore constituting a promising alternative for the treatment of malaria. Despite its promise, the development of Ang II as an antimalarial is limited by its potent induction of vasoconstriction and its rapid degradation within minutes. Here, we used peptide design to perform targeted chemical modifications to Ang II to generate conformationally restricted (disulfide-crosslinked) peptide derivatives with suppressed vasoconstrictor activity and increased stability. Designed constrained peptides were synthesized chemically and then tested for antiplasmodial activity. Two lead constrained peptides were identified (i.e., peptides 1 and 2), each composed of 10 amino acid residues. These peptides exhibited very promising activity in both our Plasmodium gallinaceum (>80%) and Plasmodium falciparum (>40%) models, an activity that was equivalent to that of Ang II, and led to complete suppression of vasoconstriction. In addition, peptide 5 exhibited partial activity towards the pre-erythrocytic stage (98% of activity against P. gallinaceum), thus suggesting that it may be possible to design peptides that target specific stages of the malaria life cycle. The Ang II derived stable scaffolds presented here may provide the basis for development of a new generation of peptide-based drugs for the treatment of malaria. Silva AF, Torres MT, Silva LS, et al. Angiotensin II-derived constrained peptides with antiplasmodial activity and suppressed vasoconstriction. Sci Rep. 2017;7(1):14326. Neprilysin Is Required for Angiotensin-(1-7)'s Ability to Enhance Insulin Secretion via Its Proteolytic Activity to Generate Angiotensin-(1-2). Recent work has renewed interest in therapies targeting the renin-angiotensin system (RAS) to improve ?-cell function in type 2 diabetes. Studies show that generation of angiotensin-(1-7) by ACE2 and its binding to the Mas receptor (MasR) improves glucose homeostasis, partly by enhancing glucose-stimulated insulin secretion (GSIS). Thus, islet ACE2 upregulation is viewed as a desirable therapeutic goal. Here, we show that, although endogenous islet ACE2 expression is sparse, its inhibition abrogates angiotensin-(1-7)-mediated GSIS. However, a more widely expressed islet peptidase, neprilysin, degrades angiotensin-(1-7) into several peptides. In neprilysin-deficient mouse islets, angiotensin-(1-7) and neprilysin-derived degradation products angiotensin-(1-4), angiotensin-(5-7), and angiotensin-(3-4) failed to enhance GSIS. Conversely, angiotensin-(1-2) enhanced GSIS in both neprilysin-deficient and wild-type islets. Rather than mediating this effect via activation of the G-protein-coupled receptor (GPCR) MasR, angiotensin-(1-2) was found to signal via another GPCR, namely GPCR family C group 6 member A (GPRC6A). In conclusion, in islets, intact angiotensin-(1-7) is not the primary mediator of beneficial effects ascribed to the ACE2/angiotensin-(1-7)/MasR axis. Our findings warrant caution for the concurrent use of angiotensin-(1-7) compounds and neprilysin inhibitors as therapies for diabetes. Brar GS, Barrow BM, Watson M, et al. Neprilysin Is Required for Angiotensin-(1-7)'s Ability to Enhance Insulin Secretion via Its Proteolytic Activity to Generate Angiotensin-(1-2). Diabetes. 2017;66(8):2201-2212. Angiotensin-(1-7) administration attenuates Alzheimer's disease-like neuropathology in rats with streptozotocin-induced diabetes via Mas receptor activation. Diabetes mellitus (DM) is associated with cognitive deficits and an increased risk of Alzheimer's disease (AD). Recently, a newly identified heptapeptide of the renin-angiotensin system (RAS), angiotensin-(1-7) [Ang-(1-7)], was found to protect against brain damage. This study investigated the effects of Ang-(1-7) on diabetes-induced cognitive deficits. Sprague-Dawley rats were randomly divided into four groups. Diabetes was induced via single i.p. streptozotocin (STZ) injections. Ten weeks after diabetes induction, rats in each group received an intracerebral-ventricular (ICV) infusion of either vehicle, Ang-(1-7) alone, or Ang-(1-7)+A779 daily for two weeks. At the end of the study, Morris water maze (MWM) tests were performed to test cognitive functions before the rats were euthanized. Ang-(1-7) treatment significantly reduced escape latencies in diabetic rats in acquisition trials and markedly enhanced platform area crossing frequency and time spent in the target quadrant in probe trials (3.0±0.39 vs. 1.0±0.33, 39.39±1.11% vs. 25.62±3.07%, respectively, P<0.01). Ang-(1-7) treatment ameliorated damage to the ultrastructure of hippocampal synapses, reduced the expression of hippocampal phospho-tau at Ser396 (P<0.01), Ser404 (P<0.01) and Ser202/Thr205 (P<0.05), and decreased amyloid-? 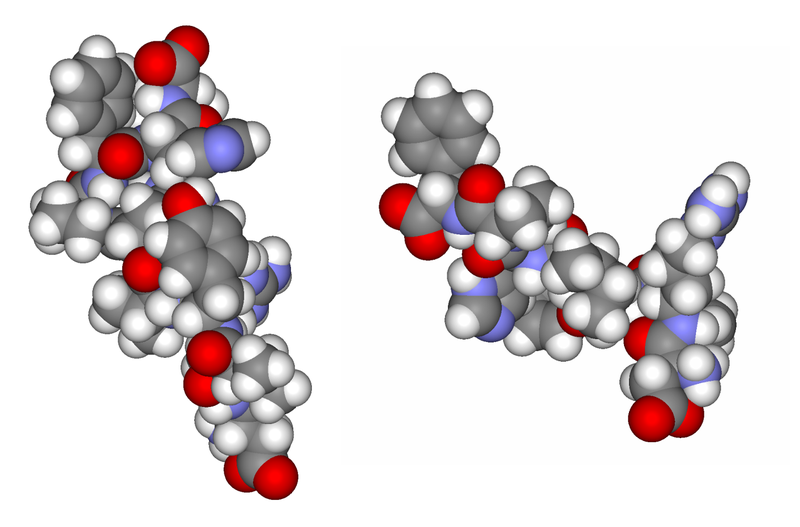 oligomer and both soluble and insoluble ?-amyloid peptide 1-42 (A? 1-42) and A? 1-40 levels (P<0.01). These protective effects were significantly reversed by the co-administration of A779. These findings show that Ang-(1-7) is a promising therapeutic target for diabetes-induced cognitive impairment. The neuroprotective effects of Ang-(1-7) were mainly through Mas receptor (MasR) activation. Chen JL, Zhang DL, Sun Y, et al. Angiotensin-(1-7) administration attenuates Alzheimer's disease-like neuropathology in rats with streptozotocin-induced diabetes via Mas receptor activation. Neuroscience. 2017;346:267-277. Cardiac hypertrophy occurs as an adaptation to hypertension but a sustained hypertrophic response can ultimately lead to heart failure. Angiotensin-II (Ang II) is released following hemodynamic overload and stimulates a cardiac hypertrophic response. AngII also increases expression of the regulatory cytokine, transforming growth factor-?1 (TGF?1), which is also implicated in the cardiac hypertrophic response and can stimulate activation of Smad2/3 as well as TGF?-activated kinase 1 (TAK1) signaling mediators. To better understand the downstream signaling events in cardiac hypertrophy, we therefore investigated activation of Smad2/3 and TAK1 signaling pathways in response to Ang II and TGF?1 using primary neonatal rat cardiomyocytes to model cardiac hypertrophic responses. Small interfering RNA (siRNA) knockdown of Smad 2/3 or TAK1 protein or addition of the TGFβ type I receptor inhibitor, SB431542, were used to investigate the role of downstream mediators of TGFβ signaling in the hypertrophic response. Our data revealed that TGF?1 stimulation leads to cardiomyocyte hypertrophic phenotypes that were indistinguishable from those occurring in response to Ang II. In addition, inhibition of the TGF?1 type receptor abolished Ang II-induced hypertrophic changes. Furthermore, the hypertrophic response was also prevented following siRNA knockdown of TAK1 protein, but was unaffected by knockdown of Smad2/3 proteins. We conclude that Ang II-induced cardiomyocyte hypertrophy in vitro occurs in a TAK1-dependent, but Smad-independent, manner. Cyclophilin A enhances vascular oxidative stress and the development of angiotensin II¨Cinduced aortic aneurysms. Inflammation and oxidative stress are pathogenic mediators of many diseases, but molecules that could be therapeutic targets remain elusive. Inflammation and matrix degradation in the vasculature are crucial for abdominal aortic aneurysm (AAA) formation. Cyclophilin A (CypA, encoded by Ppia) is highly expressed in vascular smooth muscle cells (VSMCs), is secreted in response to reactive oxygen species (ROS) and promotes inflammation. Using the angiotensin II (AngII)-induced AAA model in Apoe-/- mice, we show that Apoe-/-Ppia-/- mice are completely protected from AngII-induced AAA formation, in contrast to Apoe-/-Ppia+/+ mice. Apoe-/-Ppia-/- mice show decreased inflammatory cytokine expression, elastic lamina degradation and aortic expansion. These features were not altered by reconstitution of bone marrow cells from Ppia+/+ mice. Mechanistic studies showed that VSMC-derived intracellular and extracellular CypA are required for ROS generation and matrix metalloproteinase-2 activation. These data define a previously undescribed role for CypA in AAA formation and suggest CypA as a new target for treating cardiovascular disease. OBJECTIVE: Angiotensin peptides play a central role in cardiovascular physiology and pathology. Among these peptides, angiotensin II (Ang II) has been investigated most intensively. However, further angiotensin peptides such as Ang 1-7, Ang III, and Ang IV also contribute to vascular regulation, and may elicit additional, different, or even opposite effects to Ang II. Here, we describe a novel Ang II-related, strong vasoconstrictive substance in plasma from healthy humans and end-stage renal failure patients. METHODS AND RESULTS: Chromatographic purification and structural analysis by matrix-assisted laser desorption/ionisation time-of-flight/time-of-flight (MALDI-TOF/TOF) revealed an angiotensin octapeptide with the sequence Ala-Arg-Val-Tyr-Ile-His-Pro-Phe, which differs from Ang II in Ala1 instead of Asp1. 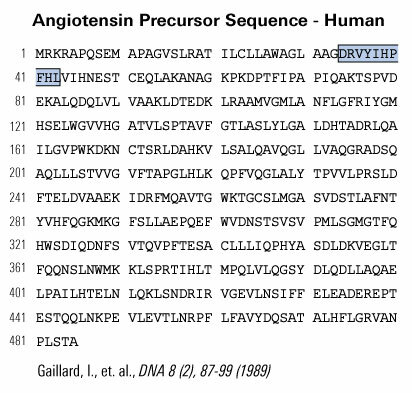 Des[Asp1]-[Ala1]-Ang II, in the following named Angiotensin A (Ang A), is most likely generated enzymatically. In the presence of mononuclear leukocytes, Ang II is converted to Ang A by decarboxylation of Asp1. Ang A has the same affinity to the AT1 receptor as Ang II, but a higher affinity to the AT2 receptor. In the isolated perfused rat kidney, Ang A revealed a smaller vasoconstrictive effect than Ang II, which was not modified in the presence of the AT2 receptor antagonist PD 123319, suggesting a lower intrinsic activity at the AT1 receptor. Ang II and Ang A concentrations in plasma of healthy subjects and end-stage renal failure patients were determined by matrix-assisted laser desorption/ionisation mass-analysis, because conventional enzyme immunoassay for Ang II quantification did not distinguish between Ang II and Ang A. In healthy subjects, Ang A concentrations were less than 20% of the Ang II concentrations, but the ratio Ang A/Ang II was higher in end-stage renal failure patients. CONCLUSIONS: Ang A is a novel human strong vasoconstrictive angiotensin-derived peptide, most likely generated by enzymatic transformation through mononuclear leukocyte-derived aspartate decarboxylase. Plasma Ang A concentration is increased in end-stage renal failure. Because of its stronger agonism at the AT2 receptor, Ang A may modulate the harmful effects of Ang II. Isolation and identification of proangiotensin-12, a possible component of the renin-angiotensin system. Nagata S, Kato J, Sasaki K, Minamino N, Eto T, Kitamura K. Biochem Biophys Res Commun. 2006;350(4):1026-31. Central administration of angiotensin IV (Ang IV) or its analogues enhance performance of rats in passive avoidance and spatial memory paradigms. The purpose of this study was to examine the effect of a single bolus injection of two distinct AT4 ligands, Nle1-Ang IV or LVV-haemorphin-7, on spatial learning in the Barnes circular maze. Mean number of days for rats treated with either Nle1-Ang IV or LVV-haemorphin-7 to achieve learner criterion is significantly reduced compared with controls (P < 0.001 and P < 0.05 respectively). This is due to enhanced ability of the peptide-treated rats to adopt a spatial strategy for finding the escape hatch. In all three measures of learning performance, (1) the number of errors made, (2) the distance travelled and (3) the latency in finding the escape hatch, rats treated with either 100 pmol or 1 nmol of Nle1-Ang IV or 100 pmol LVV-haemorphin-7 performed significantly better than the control groups. As early as the first day of testing, the rats treated with the lower dose of Nle1-Ang IV or LVV-haemorphin-7 made fewer errors (P < 0.01 and P < 0.05 respectively) and travelled shorter distances (P < 0.05 for both groups) than the control animals. The enhanced spatial learning induced by Nle1-Ang IV (100 pmol) was attenuated by the co-administration of the AT4 receptor antagonist, divalinal-Ang IV (10 nmol). Thus, administration of AT4 ligands results in an immediate potentiation of learning, which may be associated with facilitation of synaptic transmission and/or enhancement of acetylcholine release. The renin-angiotensin system plays a critical role in blood pressure control and body fluid and electrolyte homeostasis. Besides angiotensin (Ang) II, other Ang peptides, such as Ang III [Ang-(2-8)], Ang IV [Ang-(3-8)], and Ang-(1-7) may also have important biological activities. Ang-(1-7) has become an angiotensin of interest in the past few years, because its cardiovascular and baroreflex actions counteract those of Ang II. Unique angiotensin-binding sites specific for this heptapeptide and studies with a choosen Ang-(1-7) antagonist indicated the existence of a distinct Ang-(1-7) receptor. We demonstrate that genetic erase of the G protein-coupled receptor encoded by the Mas protooncogene abolishes the binding of Ang-(1-7) to mouse kidneys. Accordingly, Mas-deficient mice completely lack the antidiuretic action of Ang-(1-7) after an acute water load. Ang-(1-7) binds to Mas-transfected cells and elicits arachidonic acid release. Furthermore, Mas-deficient aortas lose their Ang-(1-7)-induced relaxation response. Collectively, these findings identify Mas as a functional receptor for Ang-(1-7) and provide a clear molecular basis for the physiological actions of this biologically active peptide. Santos RA, Simoes e silva AC, Maric C, et al. Mas. Proc Natl Acad Sci USA. 2003;100(14):8258-63. Characterization of a new specific antagonist for angiotensin-(1-7), D-pro7-angiotensin-(1-7). Angiotensin-(1-7) [Ang-(1-7)] has biological actions that can often be distinguished from those of angiotensin II (Ang II). Recent studies indicate that the effects of Ang-(1-7) are mediated by specific receptor(s). We now report the partial characterization of a new antagonist choosen for Ang-(1-7), D-Pro7-Ang-(1-7). D-Pro7-Ang-(1-7) (50 pmol) inhibited the hypertensive effect induced by microinjection of Ang-(1-7) [41 vs 212 mm Hg, 25 pmol Ang-(1-7) alone] into the rostral ventrolateral medulla without changing the effect of Ang II (162.5 vs 192.5 mm Hg after 25 pmol Ang II alone). At 10(-7) mol/L concentration, it completely blocked the endothelium-dependent vasorelaxation produced by Ang-(1-7) (10(-10) to 10(-6) mol/L) in the mouse aorta. The antidiuresis produced by Ang-(1-7) (40 pmol/100 g body weight) in water-loaded rats was also blocked by its analog [1 microg/100 g body weight; 3.080.8 vs 1.270.33 mL in Ang-(1-7)-treated rats]. D-Pro7-Ang-(1-7) at a molar ratio of 40:1 did not change the hypotensive effect of bradykinin. Moreover, D-Pro7-Ang-(1-7) did not affect the dipsogenic effect produced by intracerebroventricular administration of Ang II (11.41.15 vs 8.81.2 mL/h after Ang II) and did not show any demonstrable angiotensin-converting enzyme inhibitory activity in assays with the synthetic substrate Hip-His-Leu and rat plasma as a source of enzyme. Autoradiography studies with 125I-Ang-(1-7) in mouse kidney slices showed that D-Pro7-Ang-(1-7) competed for the binding of Ang-(1-7) to the cortical supramedullary region. In Chinese hamster ovary cells stably transfected with the AT1 receptor subtype, D-Pro7-Ang-(1-7) did not compete for the specific binding of 125I-Ang-II in concentrations up to 10(-6) mol/L. There was also no significant displacement of Ang II binding to angiotensin type 2 receptors in membrane preparations of adrenal medulla. These data indicate that D-Pro7-Ang-(1-7) is a choosen antagonist for Ang-(1-7), which can be useful to clarify the functional role of this heptapeptide. Santos RA, Haibara AS, Campagnole-santos MJ, et al. Hypertension. 2003;41(3 Pt 2):737-43. Angiotensin IV in the central nervous system. Von bohlen und halbach O. Cell Tissue Res. 2003;311(1):1-9. Biosynthetic pathways for the formation of neuroactive peptides and the processes for their inactivation include several enzymatic steps. In addition to enzymatic processing and degradation, several neuropeptides have been shown to undergo enzymatic conversion to fragments with retained or modified biological activity. This has most clearly been demonstrated for e.g. opioid peptides, tachykinins, calcitonin gene-related peptide (CGRP) as well as for peptides belonging to the renin-angiotensin system. Sometimes the released fragment shares the activity of the parent compound. However, in many cases the conversion reaction is linked to a change in the receptor activation profile, i.e. the generated fragment acts on and stimulates a receptor not recognized by the parent peptide. This review will describe the characteristics of certain neuropeptide fragments having the ability to modify the biological action of the peptide from which they are derived. Focus will be directed to the tachykinins, the opioid peptides, angiotensins as well as to CGRP, bradykinin and nociceptin. The kappa opioid receptor partial opioid peptide, dynorphin, recognized for its ability to produce dysphoria, is converted to the delta opioid receptor agonist Leu-enkephalin, with euphoric properties. The tachykinins, typified by substance P (SP), is converted to the bioactive fragment SP(1-7), a heptapeptide mimicking some but opposing other effects of the parent peptide. The bioactive angiotensin II, known to bind to and stimulate the AT-1 and AT-2 receptors, is converted to angiotensin IV (i.e. angiotensin 3-8) with preference for the AT-4 sites or to angiotensin (1-7), not recognized by any of these receptors. Both angiotensin IV and angiotensin (1-7) are biologically active. For example angiotensin (1-7) retains some of the actions ascribed for angiotensin II but is shown to counteract others. Thus, it is obvious that the activity of many neuroactive peptides is modulated by bioactive fragments, which are formed by the action of a variety of peptidases. This phenomenon appears to represent an important regulatory mechanism that modulates many neuropeptide systems but is generally not acknowledged. Although angiotensin II has long been considered to represent the end product of the renin-angiotensin system (RAS), there is accumulating evidence that it encompasses additional effector peptides with diverse functions. In this respect, angiotensin IV (Ang IV) formed by erase of the two N terminal amino acids, has sparked great interest because of its wide range of physiological effects. Among those, its facilitatory role in memory acquisition and retrieval is of special therapeutic relevance. High affinity binding sites for this peptide have been denoted as AT(4)- receptors and, very recently, they have been proposed to correspond to the membrane-associated OTase/ IRAP aminopeptidase. This offers new opportunities for examining physiological roles of Ang IV in the fields of cognition, cardiovascular and renal metabolism and pathophysiological conditions like diabetes and hypertension. Still new recognition sites may be unveiled for this and other angiotensin fragments. Recognition sites for Ang-(1-7) (erase of the C terminal amino acid) are still elusive and some of the actions of angiotensin III (erase of the N terminal amino acid) in the CNS are hard to explain on the basis of their interaction with AT(1)-receptors only. A more thorough cross-talk between in vitro investigations on native and transfected cell lines and in vivo investigations on healthy, diseased and transgenic animals may prove to be essential to further unravel the molecular basis of the physiological actions of these small endogenous angiotensin fragments. 1,25-Dihydroxyvitamin D(3) is a negative endocrine regulator of the renin-angiotensin system. Inappropriate activation of the renin-angiotensin system, which plays a central role in the regulation of blood pressure, electrolyte, and volume homeostasis, may represent a major risk factor for hypertension, heart attack, and stroke. Mounting evidence from clinical studies has demonstrated an inverse relationship between circulating vitamin D levels and the blood pressure and/or plasma renin activity, but the mechanism is not understood. We show here that renin expression and plasma angiotensin II production were increased severalfold in vitamin D receptor-null (VDR-null) mice, leading to hypertension, cardiac hypertrophy, and increased water intake. However, the salt- and volume-sensing mechanisms that control renin synthesis are still intact in the mutant mice. In wild-type mice, inhibition of 1,25-dihydroxyvitamin D(3) [1,25(OH)(2)D(3)] synthesis also led to an increase in renin expression, whereas 1,25(OH)(2)D(3) injection led to renin suppression. We found that vitamin D regulation of renin expression was independent of calcium metabolism and that 1,25(OH)(2)D(3) markedly suppressed renin transcription by a VDR-mediated mechanism in cell cultures. Hence, 1,25(OH)(2)D(3) is a novel negative endocrine regulator of the renin-angiotensin system. Its apparent critical role in electrolytes, volume, and blood pressure homeostasis suggests that vitamin D analogues could help prevent or ameliorate hypertension. Li YC, Kong J, Wei M, Chen ZF, Liu SQ, Cao LP. J Clin Invest. 2002;110(2):229-38. The role of angiotensin II (AII) and angiotensin IV (AIV) as inducers of PAI-1 expression during hypertension was studied in vivo. A 2-week infusion of AII (300 ng/kg/min) via an osmotic pump increased systolic blood pressure (171 +/- 2 vs. 138 +/- 6 mm Hg), urinary protein excretion (32 +/- 6 vs. 14 +/- 2 mg/day), and renal (2.2 +/- 0.5 vs. 1.0 +/- 0.1) and cardiac (1.8 +/- 0.3 vs. 1.0 +/- 0.1) gene expression of plasminogen activator inhibitor 1 (PAI-1). AIV infusion did not affect any of the above with the exception of PAI-1 gene expression which was increased in the left ventricles (1.7 +/- 0.3 vs. 1.0 +/- 0.1). AII-infused rats displayed a decreased creatinine clearance (538 +/- 75 vs. 898 +/- 96 ml/min) and hypertrophic left ventricles (0.275 +/- 0.006 vs. 0.220 +/- 0.011 g/100 g). Our results demonstrate that AII but not AIV infusion is associated with increased renal PAI-1 gene expression. The octapeptide hormone, angiotensin II (Ang II), exerts its major physiological effects by activating AT(1) receptors. In vivo Ang II is degraded to bioactive peptides, including Ang III (angiotensin-(2-8)) and Ang IV (angiotensin-(3-8)). These peptides stimulate inositol phosphate generation in human AT(1) receptor expressing CHO-K1 cells, but the potency of Ang IV is very low. Substitution of Asn(111) with glycine, which is known to cause constitutive receptor activation by disrupting its interaction with the seventh transmembrane helix (TM VII), Partially increased the potency of Ang IV (900-fold) and angiotensin-(4-8), and leads to partial agonism of angiotensin-(5-8). Consistent with the need for the interaction between Arg(2) of Ang II and Ang III with Asp(281), substitution of this residue with alanine (D281A) decreased the peptide's potency without affecting that of Ang IV. All effects of the D281A mutation were superseded by the N111G mutation. The increased affinity of Ang IV to the N111G mutant was also demonstrated by binding studies. A model is proposed in which the Arg(2)-Asp(281) interaction causes a conformational change in TM VII of the receptor, which, similar to the N111G mutation, eliminates the constraining intramolecular interaction between Asn(111) and TM VII. The receptor adopts a more relaxed conformation, allowing the binding of the C-terminal five residues of Ang II that switches this "preactivated" receptor into the fully active conformation.